Submastro estas malnova ŝipano de la departemento de ferdeko kiu estas responsa por la komponaĵoj de la ŝipokorpo. La Submastro superrigardas kaj kontrolas la aliajn membrojn de la ŝipferdeka departemento, kaj tipe li ne estas observisto, escepte ĉe ŝipoj kun malgrandaj ŝipanaroj. Aliaj taskoj varias depende el la tipo de ŝipo, ties ŝipanaro, kaj aliaj faktoroj. Bureau of Labor Statistics (U.S.A.) (2007). "Water Transportation Occupations" (PDF). Occupational Outlook Handbook. Government Printing Office. Konsultita 2007-04-23. Hayler, William B. (2003). American Merchant Seaman's Manual. Cornell Maritime Press. ISBN 0-87033-549-9. McLeod, William Reynolds (2000). 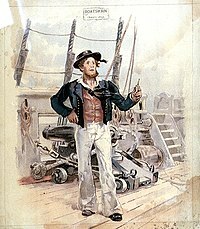 The Boatswain's Manual. Glasgow: Brown, Son and Ferguson, ltd. ISBN 0-85174-679-9. Oregon University System (2004). "Classification Number: 4512 Boatswain". Position Descriptions. Oregon University System. Arkivita el la originalo en 2008-03-27. Konsultita 2008-04-28. United States Naval Institute (1996) . The Bluejackets' Manual (21st ed. ed.). Annapolis, MD: United States Naval Institute. ISBN 1-55750-050-9. Woods Hole Oceanographic Institution (2003). "Boatswain". Position Descriptions. Woods Hole Oceanographic Institution. Arkivita el la originalo en 2008-02-27. Konsultita 2008-04-28.
International Labour Organization (2000-12-05)Seaman, Merchant Marine. International Hazard Datasheets on Occupation. Alirita 2007-05-26. Ĉi tiu paĝo estis lastafoje redaktita je 10:52, 6 jan. 2016.